You may not realize it, but your eyebrows are one of the main features defining your face. While you may get more compliments on your eyes, or spend more time applying lipstick to draw attention to your lips, if you are neglecting to take care of your brows, your look is not complete. When your eyebrows are well-shaped and maintained, your face looks younger and more even. Avoid these common eyebrow mistakes for the most flattering brows. Eyebrow trends come and go, and thank God, the overplucked, very arched look of the 90s is in the past. However, there are still many women who never got this memo, or are still living with the consequences of overplucking their eyebrows to look like Pamela Anderson. The danger of overplucking is that over time, your brows struggle to grow back, leading to a patchy look. Overplucking is also very easy to do; all you really need is a magnifying mirror, tweezers, and some time to make this big eyebrow mistake. Don’t forget to see the forest as you pluck the trees. Make small changes, then step back and evaluate how the overall shape looks. Go slowly as to resist the urge to pluck with abandon. Better yet, take the stress out of the whole process by coming to our threading salon in Chelsea! 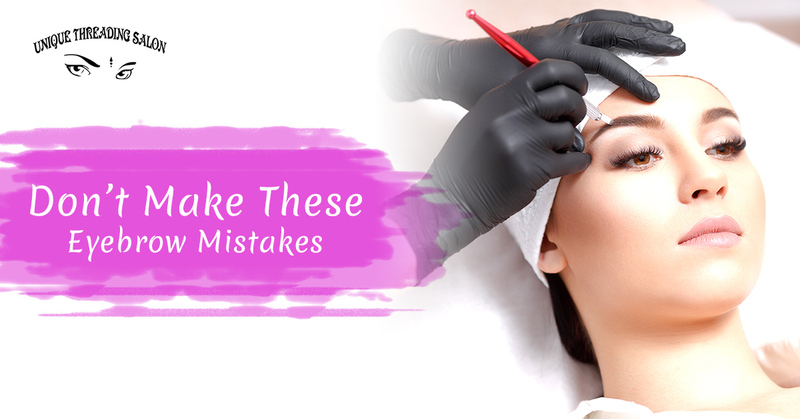 You don’t have to worry about your brows being overplucked when you leave them to the professionals. When it comes to your brows, shape is everything. The right shape for your face will give it more definition, but the wrong shape can make it look tired and aged. To map out the correct eyebrow shape, use a pencil to line the outside corner of your nostril straight up to the inner corner of your eye. This shows where your brow should start. Then, tilt the pencil so that it intersects the center of your eye. This is where the arch should be. Finally, angle it towards the corner of your eye. This is where the eyebrow should end. A common mistake women make with their brows is overplucking the center to avoid a unibrow. It’s understandable why you wouldn’t want stray hairs between your eyebrows, but you also want to make sure you are not creating too wide of a gap. If the gap between your brows is too wide, it makes you look unnatural. Make sure you aren’t plucking past the tear ducts of your eyes; this is when it starts to look strange. These days, there are so many eyebrow products that let you create perfect brows without much fuss. A quality brow pencil helps you fill in the patches, and a good brow gel will smooth and help keep your brows in place. On the other side of the coin, it’s also easy to over-apply. Make sure to use a lighthand when applying any brow-related makeup because it can quickly look quite unnatural. Eyebrow pencil should be applied in light, short strokes. Apply gel the way you apply a light coat of mascara. Take the guesswork out of great brows by coming to us for threading in Chelsea! Contact Unique Threading Salon to schedule your appointment today.